Acclivity Associates is a planning and management consulting firm committed to creating safe, sustainable, and resilient communities. 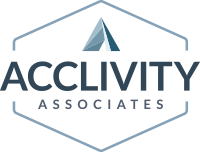 Acclivity applies expertise and innovation in program management, planning,communications, and environmental services to help our clients surmount challenges, thrive amid change, and achieve their highest potential. Acclivity Associates was formed in Denver, Colorado in 2012 as a certified small business. Acclivity team members also call Boulder, Chicago, Minneapolis, St. Louis, Steamboat Springs, and Seattle home. Our diverse backgrounds bring experience in community planning, GIS, civil engineering, disaster mitigation and recovery, communications, and environmental resources. We work with private and nonprofit organizations and all levels of government, on projects big and small. Acclivity serves private, nonprofit, and government organizations in advancing their missions and implementing solutions. We offer remote and onsite program management, a range of planning and environmental expertise, and outreach and communication services including public involvement, facilitation, and training. We help organizations to both envision successful outcomes and design and deliver practical solutions. Clients choose us to imagine the possibilities and achieve real results. The Acclivity team guides clients in improving performance, successfully managing change, and delivering successful outcomes. We currently assist clients in managing portfolios with multiple work streams, diverse geographies, and varied funding sources. Acclivity specializes in a range of community planning services, with an emphasis on resiliency and sustainability, and in strategic planning for organizations and programs. Our approach to planning involves understanding and building upon our client’s strengths and values, applying rigorous technical analysis, and facilitating meaningful community and stakeholder engagement. Acclivity staff has led outreach and communications projects for all levels of government. Our goal is to identify the specific objectives for each project and to be purposeful and creative in customizing tools and approaches to best serve client needs. Our planners and scientists work closely with clients to identify the appropriate environmental regulators and implement an agency coordination strategy that identifies and addresses all applicable environmental permitting and legal requirements.. Our team is experienced in researching and evaluating complex natural resource and socioeconomic issues related to land use, wetlands, vegetation, wildlife, transportation, noise, environmental justice, and more and in developing targeted mitigation measures to address potential impacts. Our product is a defensible document, permit, or plan tailored to address the project’s requirements and enable our client to effectively pursue their mission. In support of the Federal Emergency Management Agency’s (FEMA) Louisiana Recovery Office, Acclivity Associates provides environmental compliance expertise for the Hazard Mitigation Grant Program. Acclivity prepares National Environmental Policy Act (NEPA) documents, i.e. Categorical Exclusions (CATEX) and Records of Environmental Consideration (REC), Environmental Assessments (EA), and Environmental Impact Statements (EIS). Examples of Hazard Mitigation Grant Program projects are building, roadway, and facility elevations; building acquisitions/demolitions; stormwater drainage infrastructure improvements; and greenscaping retrofits of existing pavements. Acclivity supports FEMA in all aspects the NEPA process, from the development of alternatives and consultation with applicable regulatory agencies, to the signature on a decision document. We effectively and clearly provide environmental and socioeconomic subject matter expertise, conduct site visits to review project proposals, and perform environmental analysis to ensure the decision maker has the details necessary to make an informed decision. We evaluate and synthesize data from previous projects, provide structured review and comments on project deliverables, and ensure that results and recommendations conform to FEMA policy. We want to hear from you. Interested in working with us on a project, proposal or career? ©2015, 2017 Acclivity Associates. All Rights Reserved.